.... Yup ... NO CAKE for the birthday boy! ... 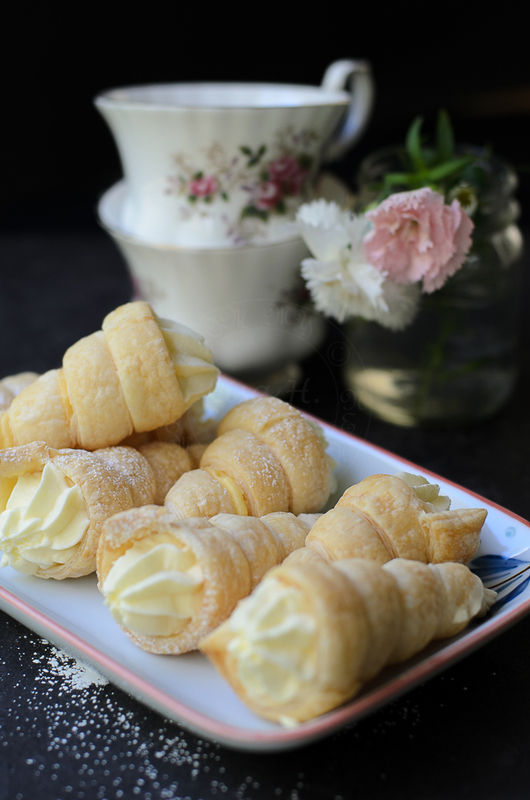 I baked him Custard Cream Horns instead, because every boys and girls must have something sinfully rich, sweet and creamy for their birthdays, right? Custard Cream horns popped up in one of our conversations sometimes ago (...errr like many years ago... insert 'embarrassed' emoticon here). Our 'reminisced - Do you remember?' 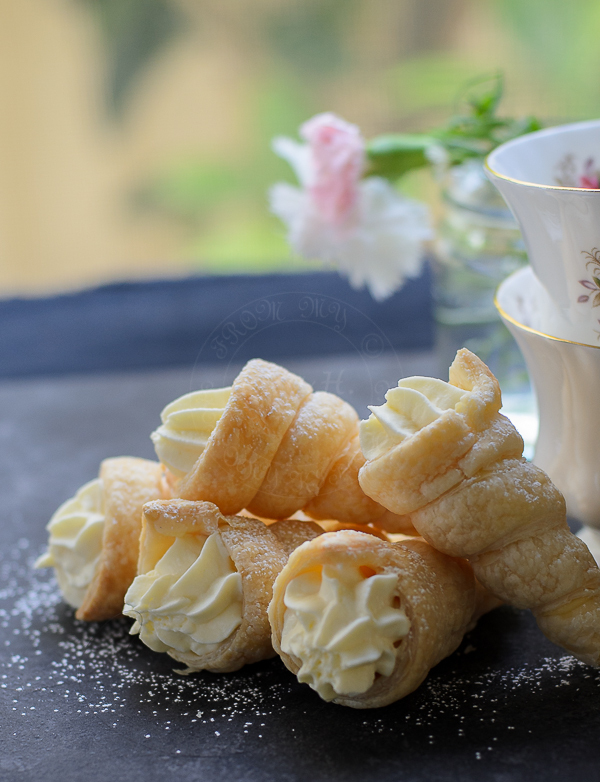 conversation always started with food but not necessarily end up having food that we 'reminisced' about... it took me years, from just talk to actually sink my teeth and bite into these Custard cream horns. Custard cream horns were one of those baked goods that I would drool over whenever I passed by a bakery shop in my hometown. Kids being kids... the creamiest... the sweetest and the prettiest bake on display will always attract their attention, and most of time, I had no spare change to grab one. I spent it all during recess in school. I definitely would be in hot soup if I were to ask for extra from my parents. I hijacked your story :)... today's post supposed to be about YOU!!! oh Yeah... we were reminiscing about Custard Cream Horn, and I thought, it'll be a good idea to bake some instead of cake, for your 5* birthday. Pre-heat oven to 180C with baking tray (in the oven). Give puff pastry a roll over few times to a thinner layer then divide each sheets of puff pastry into 12 long strips. Lightly oil conical shaped moulds (called horns ;p). Roll the pastry strip around each mould, overlapping a little. 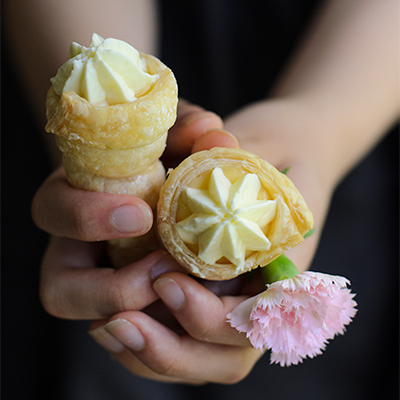 Moisten finger with water and 'glue' both end of pastry. 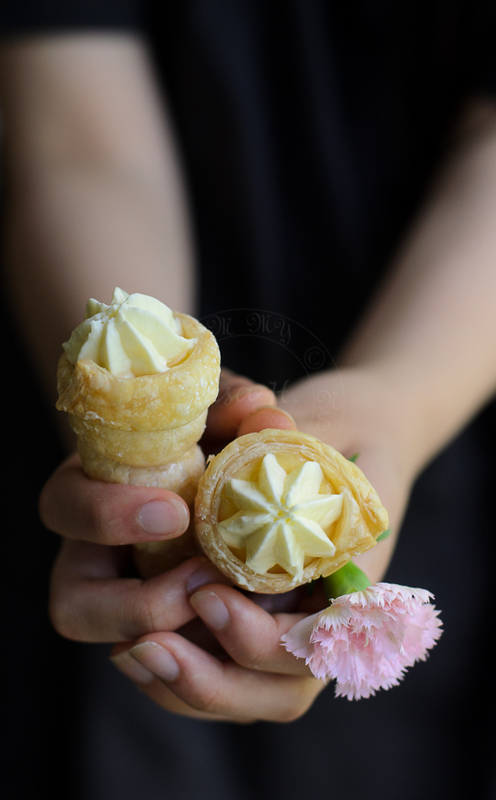 Arrange on baking paper (I have a set of moulds that has a flat round opening, hence easier to arrange them straight up to get that perfect shape cones) then slide the baking paper onto hot baking tray. Let the horns completely cooled before piping in custard and cream. Mix custard powder with 1/2 cup of milk until smooth. Heat remaining milk in saucepan over medium heat. Lower the heat and stir continuously until custard thicken. Place a piece of clingwrap over the custard (to avoid skin forming). Whip cream with sugar till soft peak. Those are the cutest little desserts every and I bet they really delicious too!! Thank You Renee :D and its easy to make too. Mmm..my memories of cream horns were from the roti man who used to go around on his motorcycle in the evening! Cream horns were the treat! Happy birthday! Oh ya mamak roti... I think its the roti version kan? These look phenomenal! What a brilliant birthday dessert! 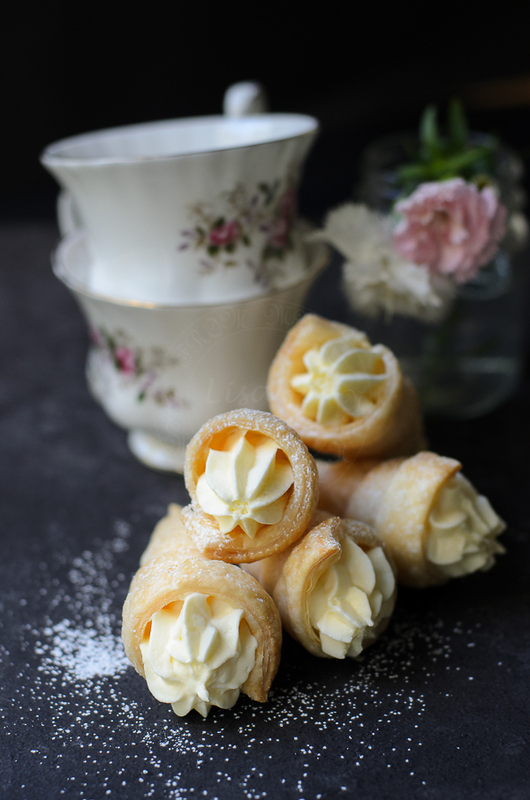 Beautiful photos and divine looking cream horns!! Yum! I wish I could eat some! !